Update February 23, 2015 – I’d like to thank MMA’s official record keeper, Kirik Jenness, for reproducing portions of this story and featuring it prominently at his flagship site mixedmartialarts.com. I encourage anyone interested in the subject to visit there and engage in the dialogue. Yesterday the UFC announced their plans for stricter Performance Enhancing Drug testing, with more robust funding for regulating Athletic Commissions who wish to test more aggressively and also plans for the UFC to conduct their own out of competition tests. While the first part of the UFC’s plan is easy to achieve, it just takes money and the will of athletic commissions to meaningfully test, the latter comes with legitimate legal and logistical problems. Zuffa CEO Lorenzo Fertitta acknowledged that the plan is still a work in progress but given the recent spate of high profile drug test failures the plan needed to be announced even though it is unrefined. 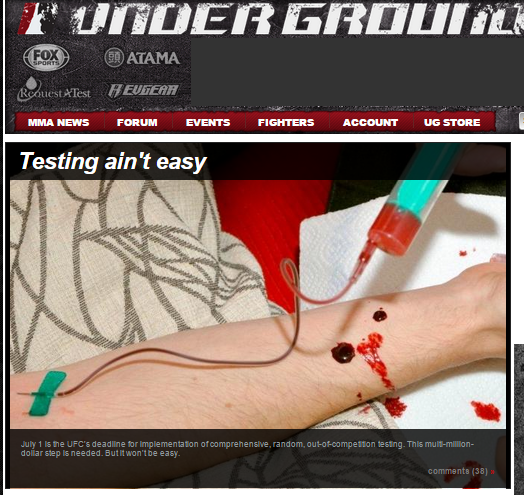 In short the UFC plans to contract with a third party provider to set up and implement the testing program. The UFC will need to fund the program but otherwise stay out of its day to day operations to avoid any conflict of interest. That being said, to meaningfully reach this goal the UFC needs to do more than write a large check. Legal, logistical and contractual arrangements need to be made. Below are a few practical problems that need to be addressed. Unless specifically allowed in a fighter’s existing contract, fighters will need to agree to cooperate with Zuffa’s out of competition testing program. Zuffa’s standard contract clause regarding PED testing deals with athletes agreeing to comply with Athletic Commission testing, not a random year round Zuffa testing program. As independent contractors fighters don’t need to consent to such a term without consideration. This means that Zuffa needs new contracts to make this program a reality. They can start incorporating the needed terms in all new contracts going forward but given that most of the UFC roster is under present contract these need to be renegotiated to make the plans a reality. Here are some of the terms that will need to be addressed. a. To truly be able to test athletes at random, testers must be able to contact fighters on short notice. This means fighters will have to agree to notify Zuffa or the testing agency of their whereabouts on an on-going, year round basis. Programs such as this exist and complying with this is not particularly onerous but forced compliance must be contractually agreed. b. Zuffa noted the WADA code would likely be used for this program so fighters would need to contractually agree to comply with the WADA Prohibited List of banned substances at all times during the course of their contract. c. An agreement will need to be reached about the potential range of penalties a fighter can be exposed to for failing to cooperate with the program, be it by not cooperating with providing test samples or for failing a test. These are matters which are normally collectively bargained in major sporting organizations but here, with no fighters association, these terms need to be individually, and uniformly, agreed upon. d. If Zuffa intends to share sample results with Athletic Commissions for them to administer punishment fighters will need to consent to this disclosure of their otherwise private information. e. If Zuffa intents to act as judge jury and executioner for violations of the program due process rights will need to be established allowing fighters to challenge the evidence against them. As a practical matter it would make sense for the parties to agree to some sort of formal arbitration process using the rules that are already in place with the Nevada Athletic Commission as this is the default rule-set Zuffa and Fighters agree to where the UFC self regulates events. Whatever the process, it will need to be contractually addressed. f. If the test results are intended to be released to the public the fighters will need to agree to this as well. Fans of combat sports should support the intended reforms Zuffa announced at yesterday’s press conference but good intentions are not enough. Fighter cooperation will be needed to make this a reality. As Josh Samman notes, athletes should embrace this with open arms. It is in the sport’s long term interests for all parties to cooperate in making the needed concessions to make a meaningful out of competition testing program a reality. Hey Erik, thanks for putting this article together, extremely insightful. I’m actually from Vancouver, Canada myself and have begun a new MMA-themed blog and podcast, I’d love to have you on the show some time to discuss this in depth, I know my listeners would love it! Let’s get in touch.